First, my opinion on the results of our recent election. When the Chips are Burnt, They’re Burnt Orange. A few years ago, on an ordinary July afternoon, our family was having a routine lunch at Jason’s Deli, when the most amazing not-ordinary thing happened. We got a divine prediction: If not from heaven, then at least from Austin. As my husband was eating his chips, he suddenly stopped, A solitary ray of light shot through the window and illuminated one of the chips. A ray of burnt-orange light. 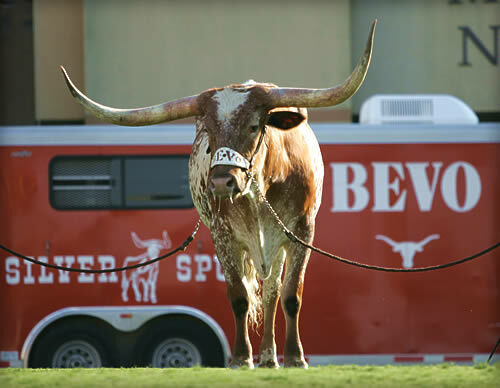 Yes, that Bevo. The beloved mascot of the University of Texas. I wanted to laugh, but I could hear a trumpet playing “The Eyes of Texas” somewhere faintly in the distance. So, I looked. 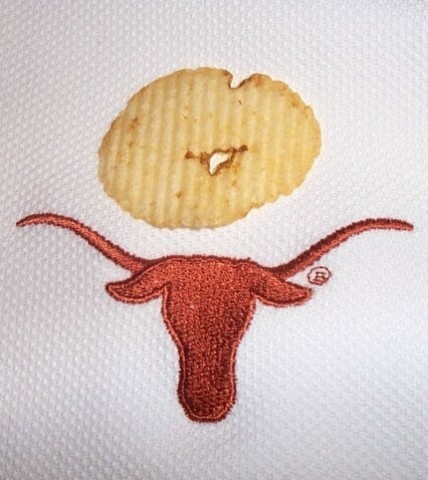 Sure enough, the Lay’s ruffled chip had the Longhorn logo on it. Now, I know it’s not a perfect image. Faith requires a measure of mystery. If you’re an Aggie, I’m sure you don’t see it. THe chip was spared. We carefully brought it home and wrapped it in plastic. As the 2005 college football season began, the chip had a place of honor. Laugh if you like, but week after week, its oracle was verified. Then, with 4th down and five yards to go on the final play of Rose Bowl, Vince Young impossibly scrambled into the end zone. And the Longhorns became national champions. The University of Texas plays for the national title again tonight. The chip is long since gone. But we did make a pilgrimage to Austin this year for the first game of the season. And they haven’t lost since. So after they win tonight? Mack Brown, you better call us with tickets for next year.